“So you’re interested in becoming a petpet herder?” asked an elderly brown Gelert named Maurice. “Yes sir!” cheerfully replied the young Mynci. Danny had recently left home in hopes of becoming a mighty adventure like the ones he had read about in his Defenders of Neopia comics or in his game, Neoquest. However, after failing to even locate his first Defenders mission, not to mention defeating the evil villain, Danny realized he might need a little more practice. Additionally his piggybank savings had quickly run dry after buying a jazzy super hero costume. Now the spotted Mynci had a new adventure – job searching. “Well, I am looking for a dedicated employee. Reliable, dependable, hard working. Do these words describe you?” asked the interviewer. “Certainly. I feel I am very hard working, and if you hired me, I would never let you down,” Danny nervously replied. Danny had already been on three job interviews before, none of them ending well. He was becoming more and more nervous about securing a job. Danny had first applied at the nearby Meridell farm where one of the farmers was having trouble with a growing slorg population eating his crops. Danny had thought he would be a perfect candidate to man the Slorgeriser X4 – protecting the food supply is like being a superhero, right? However, when Danny told the farmer a story about his beloved pet slorg, the Yurble farmer turned him away. He next interviewed at a chemistry lab in the Haunted Woods, but after accidentally placing too many Slothite chemicals together, and causing a small explosion, Danny was told Chemistry might not be his strong suit. His last interview was a position as a waiter at the Grand Bogen. Danny failed to correctly distinguish a Blunella from an Elppa, and thought a Foozette was an exotic petpet. He was again turned away. “Saving petpets and earning some neopoints to fund my adventure!” A great combination, he thought. So here Danny was, sitting nervously in a wooden chair, awaiting another question from the interviewer. “What are your qualifications for this position, Danny?” questioned Maurice. “Oh yes. Keep all the petpets safe and sound in their pen and watch out for the evil Balthazar,” replied Danny. “Wonderful, sir!” replied the ecstatic Mynci. “Well, here’s the field, Danny. The petpets like to play around here, and their pen is over there. You have to watch out for the doglefoxes, though. Quite fast they are. And be sure to watch out for Balthazar. He always seems to come from between those two hills over there.” Maurice pointed. Danny listened intently to everything the Gelert said, promising himself that he would not mess up his first job. “Yes sir. Keep an eye on the dogelfoxes and Balthazar always comes up between those hills,” answered Danny. “Right – dogelfoxes are fast. I’ll remember that, sir,” mumbled Danny. A few days had passed since Danny’s interview and so far things were going well. He had seen Balthazar a few times, but Danny had managed to get all the petpets to safety before Balthazar came close. Danny’s biggest problem was keeping the petpets in the pen after he carefully put them there. After closer inspection, he noticed that there were a few boards loose and one of the doors didn’t close completely. “Maurice, sir, can I ask you something?” Danny said cautiously. “Ask away, young one. Is it about the dogelfoxes? I’ve never seen anything so small run so fast,” answered the Gelert. “I never noticed that – good eyes! There’s some wood and nails in the tool shed; think you could fix it in your spare time?” replied Maurice. “Certainly. I’ll get to work on it soon,” cheerfully replied Danny. Danny got to work right away, fixing the broken pen in no time. Now when Balthazar showed up, Danny could place the petpets in the pen without fear of them popping out again a few minutes latter. Then, once Balthazar was clear from sight, Danny would let the petpets out to enjoy their entire field again. This little fix gave Danny some extra time on the job. 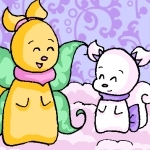 One day he herded all the petpets to the safety of their pen so that he could answer a question he had – Why did Balthazar always come up between those two exact hills, anyways? At first he thought that Maurice had just been confused about Balthazar. But after a week on the job, Danny was sure – Balthazar always came up between those two hills. Never anywhere else. So Danny packed a lunch, put on some good hiking shoes, and set off. After a few hours of detective work, he found the answer. Along the north was a river that was too wide for even Balthazar to swim across. The west side featured a high cliff. The east and south edges of the field were surrounded by the local town and Balthazar would never travel through such a populated area. So the only way to get into the petpet’s field was through the small gap between the cliff and river. Armed with this knowledge, he walked back to the petpets to talk to Maurice. “Good afternoon, Maurice,” said Danny. “Well, I walked out there to get a closer look. It appears that on either side of the hills is a river and large cliff. If we put up a fence there, we would never have a problem with Balthazar again,” said Danny. It took Danny longer than expected to build the fence. He worked five days to build the fence between the hills, but it was worth it. Balthazar never showed up again. Additionally there were no reports of Balthazar sightings in the woods near the town. It appeared that Balthazar had decided to move on now that the petpet fields were so well protected. “Isn’t that a good thing?” asked Danny. “Well, of course, safer petpets and all that. But that’s just the thing; the petpets are safe now, so I really don’t need a petpet herder anymore. I am very grateful for all your hard work around here and I’m sure you’ll go far, Danny. I’ll add a little bonus into your last pay week because of all the improvements you made. It’s been nice working with you,” said Maurice. “Umm, thanks, Maurice, glad to help, sir,” said Danny, who was a bit surprised. The elderly Gelert wandered of to check on a sleeping angelpuss. Danny sat down on the grass and watched two dogelfoxes race around the field. ‘I guess I could see if that job at the recycling plant is still open,’ thought Danny. ‘I heard they were having trouble with robot petpets getting in the machinery. I bet I could set up a little playground with toys and such so that the petpets would play there rather than the machinery. Or maybe I could design the recycling plant better so it scans the shapes of the petpets....’ And so Danny went, off on his new adventure, which is most certainly a story for next time.